About the name – taken from a Native American word meaning “whale,” whales can be seen some times of the year from this vantage point. We didn’t see any, but we were there during September when they don’t hang out on this part of the coast. Getting to the park from Cannon Beach would seem easy from a map. The road begins at the northern “suburbs” of Cannon Beach, winding past some homes tucked into the hillside before it becomes the actual park. What a road, though! The road is extremely narrow and, while paved, it is tough to see around hairpin turns as drivers come flying at you from above. When you finally get to the entrance gate, they will want $3 for a day use fee. The walkways lead to picturesque viewing locations where the scenes can be quite breathtaking. There was another road leading to another viewpoint in the park, but we decided not to go further on the roads. 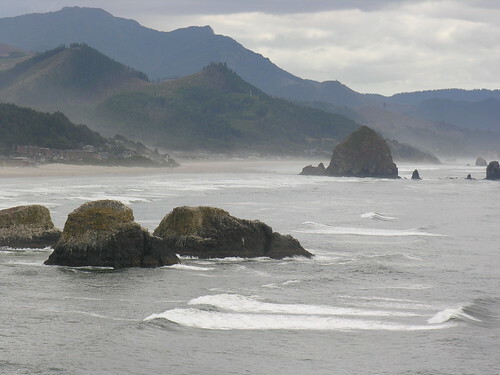 There are hiking trails, but with it starting to rain, we took photos of Cannon Beach, Haystack Rock and the shore and took cover. 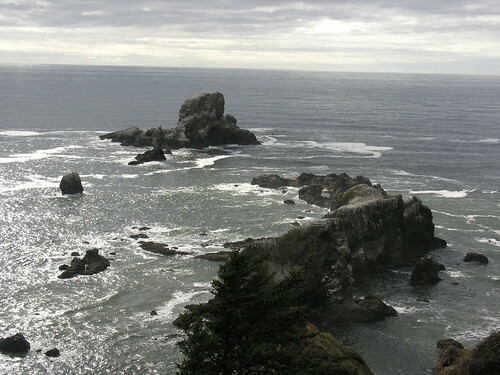 Tillamook Lighthouse and miles and miles of the sandy beach are there to see. Inspiringly tall pines are there in the distance for your hiking adventures. Film crews have used several locations around the park for movies. 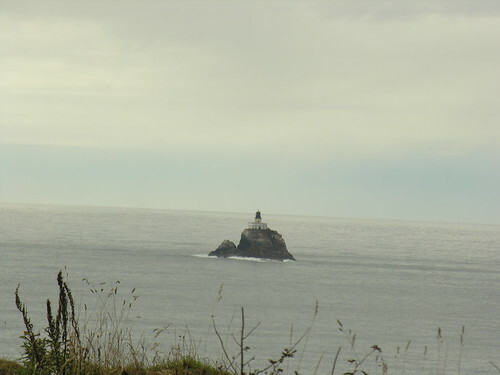 Do you recognize the place where they filmed Goonies? You can just imagine the Natives and explorers haggling over the whale blubber and oil on the coastal beach below. If you don’t hike, it’s still worth a look for photos and a chance to get away from the developed resorts, breathe the salt air and relax. Just take that road in carefully! During the busy summer months, parking is at a premium, so there is a shuttle from Cannon Beach public parking that you can take to Ecola. Tomorrow – Come back for a recipe from a really cranky person – and a great restaurant! This entry was posted on Thursday, September 24th, 2009 at 6:00 am	and is filed under Beach, Family Fun, Hiking, Mountains, Scenery, Travel. You can follow any responses to this entry through the RSS 2.0 feed. You can leave a response, or trackback from your own site.